There's often a sense at this time of year that the Poles have been cursed by the Gods to endure an eternal Winter. But then April draws near - tantalizing April.... Easter and Spring are on the way! 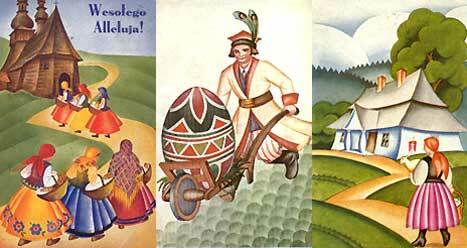 Easter in Poland is a magnificent occasion. Sometimes it feels rather more pagan than Christian - the glorious Polish incarnation of the Palm branch has little bearing on the ones you'll see in Bacardi adverts (there weren't too many greenhouses in medieval Poland). Yet it's the little idiosyncrasies that lend the festival its special magic. On Easter Monday things go rather bonkers when the spectre of Smigus Dyngus rears its mischievous head. It may be advisable to carry an umbrella on this day, or better still a water pistol, as Poles have carte blanche to drench each other with pails of water. If you want to escape such shenanigans, head for the Misteria Paschalia festival of classical music. A host of European stars will be performing at venues such as the Philharmonic Hall and the Wieliczka Salt Mines. Have a browse through our events calendar for more details. If you're umming and ahhing about where to make your home here in Cracow, we'd recommend the brand new Gardenhouse for backpackers, Polski for mid-rangers or Pod Roza for jackpot-winners.